Traveling Trail Ridge Road, the highest road in the US, through Rocky Mountain National Park, offers sweeping views of the Rockies and unsurpassed opportunities for hiking and photography. Trail Ridge Road, Colorado is a scenic route taking you high into the Rockies, to a maximum elevation of 12,183 feet. See the full sweep of the Rocky Mountains from many of the overlooks. The perfect drive through a national park that is perhaps one of the most scenic in the world! It’s open from approximately Memorial Day to mid-October. Take US Highway 36 from Estes Park, Colorado, to Deer Ridge Junction inside Rocky Mountain National Park where Highways 36 and 34 meet. Continue on US Highway 34, which is Trail Ridge Road. This will take you through the entire park to the community of Grand Lake, Colorado, where Trail Ridge Road comes to an end. Trail Ridge Road is a distance of forty-eight miles from Estes Park to Grand Lake. It is about 2 hours of driving non-stop, but you should allow at least half-a-day travel so you can enjoy the sights. 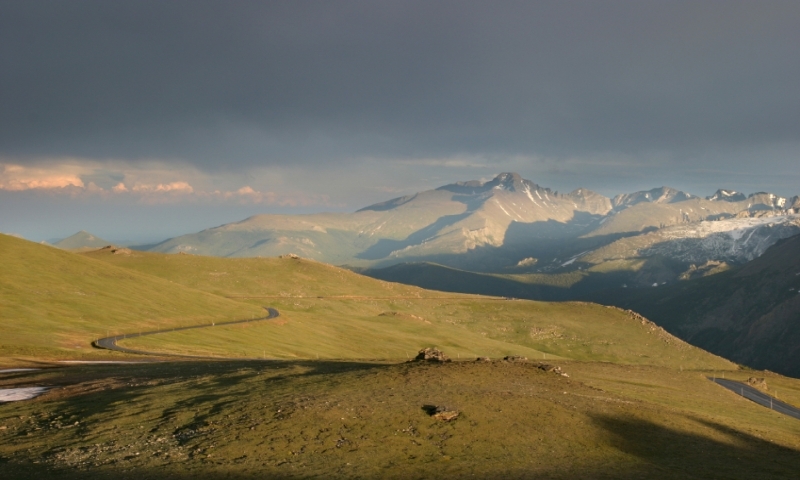 Eleven miles of Trail Ridge Road lies above tree line. You won’t see forests here, but you will enjoy the wildlife and wildflowers that bloom. Along this Rocky Mountain route, the landscape changes from forests of aspen or firs to alpine tundra. Colorado Trail Ridge Road has some sights to see, and the following are highlights that you definitely shouldn’t miss. After leaving Deer Ridge Junction, simply take the first right and enjoy a picnic here. This area is open all year, with snow play in the winter and a wonderful picnic area in summer. Awe-inspiring scenery will insist you bring out your camera. View the landscape shaped by glaciers more than 15,000 years ago. You are now at an elevation of 9,691 feet. Look out over Hidden Valley Creek where beaver live. See Horseshoe Park and Alluvial Fan from this amazing vantage point. Stay on the trail to prevent damage to this delicate ecosystem. But you’ll love the views of the Continental Divide. Glaciers flowing through the valley formed the Forest Canyon, which you’ll see beyond the flowered meadow. Here, from an elevation of 12,048 feet, you will see the Never Summer Mountains to the west. A wide variety of wildlife comes to this area in the summer months. You may see bighorn sheep, elk and deer. There is a place to eat, a gift shop and restrooms. Even though the Alpine Ridge trail is a one-quarter mile hike, it can be quite strenuous at 11,796 feet and with an elevation gain of 300 feet. So be prepared! But it’s well worth it. Here you’ll cross the Continental Divide. Stop and take the Tundra World Nature Trail. It’s only a half hour and you’ll get up close and personal to the marvelous plant life existing here at 10,775 feet. Streams on the east side of this pass flow to the Mississippi and on the west flow to the Colorado River.